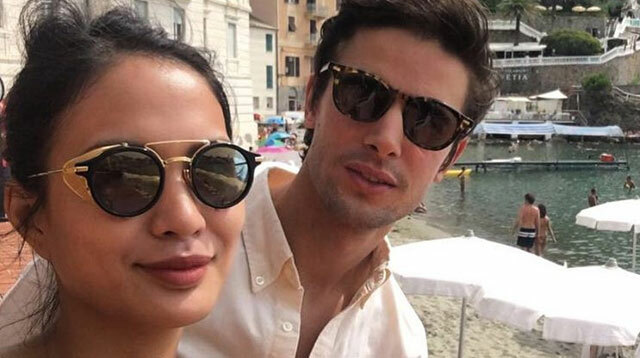 Isabelle Daza is the THIRD It Girl to tie the knot this year! After Georgina Wilson’s English wedding in April and Solenn Heussaff’s French nuptials in May, Belle is set to marry her fiancé Adrien Semblat in Tuscany, Italy this week! The couple already flew to Italy over the weekend and have since posted a series of snaps! It also looks like Belle’s It Girl gang is getting ready to jet off to the Italian countryside. After stalking on Snapchat (#sorrynotsorry), we found out that Anne Curtis, along with sis Jasmine Curtis-Smith and beau Jeff Ortega, is aboard a long-haul flight to an unknown destination. Italy, perhaps? Jas even snapped a shoefie of their matchy-matchy airport kicks! According to PEP.ph, Belle and Adrien’s nuptials will be held on Saturday, September 10. So, CGs, we all know who we’ll be stalking this weekend!